Event part of industry-led national careers roadshow for 15-18 year olds. Pictured are, students Niamh Farrelly, Adam Elmaadi, Nathan Stafford and Annie Byrne all from Scoil Ui Mhuire, Dunleer Co. Louth, with Michael Vaughan, Irish Hotels Federation and Natasha Kinsella, Dublin Regional Skills, at the National Tourism and Hospitality Careers Roadshow organised by the Irish Hotels Federation (IHF) and Dublin Regional Skills at the Aviva Stadium. The industry-led initiative gives 15-18 year olds a first-hand view of the career choices available in the sector. 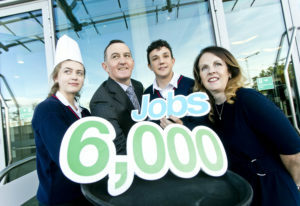 Each year hospitality and tourism businesses around the country look to recruit over 6,000 entry-level employees across all areas of their operations. Over 400 students from second level schools and Youthreach centres across Dublin and beyond gathered at the Aviva Stadium today where some of the city’s leading hotels, travel, catering and tourism businesses gave them a first-hand view of the career choices available in the sector. 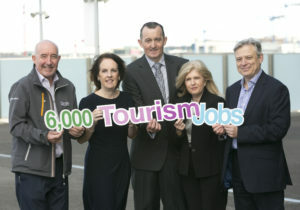 Each year hospitality and tourism businesses around the country look to recruit over 6,000 entry-level employees across all areas of their operations. 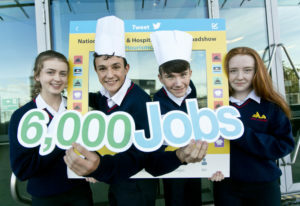 Today’s event was part of an industry-led National Tourism and Hospitality Careers Roadshow for 15-18 year olds organised by the Irish Hotels Federation (IHF) and Dublin Regional Skills in association with the Irish Hospitality Institute (IHI), Fáilte Ireland and Technological Higher Educational Association (THEA). The students heard from a panel of young individuals about careers in food and beverage, catering, accommodation services, reception, leisure centre and spa facility management, sales and marketing, human resources, travel, tour guiding, IT, management and finance. Tourism and hospitality businesses also shared details of the various pathways young people can take into these careers while education providers for both further and higher education were on hand to talk about the various tourism and hospitality courses that are available. The event included a showcase of Tourism Insight – the free online interactive programme, which provides videos and interactive tutorials on working in tourism and can be delivered in school or completed by students at home. Two students who completed the programme in 2017, announced as winners in Ireland of one of the GTTP (Global Travel Tourism Partnership) photo competitions where presented their certificates and prize on the day. The students and their Guidance Counsellors also received copies of the latest edition of Get a Life in Tourism, the IHF’s free print and digital magazine on tourism career options. 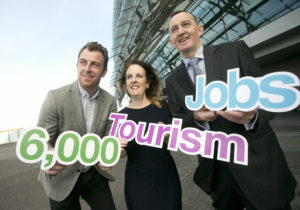 Tourism now supports an estimated 230,000 jobs in Ireland, equivalent to 11% of total employment. With over 60,000 new jobs created since 2011, the industry is well-positioned to create in excess of 40,000 additional jobs over the next five years. This Careers Roadshow is organised by the IHF and Dublin Regionals Skills, supported by IHI, Fáilte Ireland and THEA, as well as major employers in the industry including – The Doyle Collection, Dalata Hotel Group, Jurys Inn Group, Compass, Dublin Institute of Technology, The Conrad, The Gleneagle Hotel Group, Tourism Ireland, Irish Travel Agents Association, TravelPort, The Lee Hotel Group, PREM Group, Foras Na Gaeilge and GTTP. Other Exhibitors on the day also included Radisson St Helens, Clarence Hotel, Tifco, Travel Industry – Aer Lingus, Royal Caribbean, and Travel Centres & Travel Brokers. Educational Providers included Institute of Technology Blanchardstown and a number of representatives from various colleges within City of Dublin ETB. 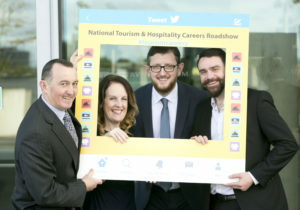 The National Tourism and Hospitality Careers Roadshow organised by the Irish Hotels Federation (IHF) and Dublin Regional Skills at the Aviva Stadium. The industry-led initiative gives 15-18 year olds a first-hand view of the career choices available in the sector. Each year hospitality and tourism businesses around the country look to recruit over 6,000 entry-level employees across all areas of their operations.